With all the bad press and trolls slating RIM lately, they should take comfort in the fact that recent reports from Kantar Worldpanel ComTech have shown that BlackBerry's market share had increased to 22.3 percent in the UK in the 12 weeks running up to June 12. This put them ahead of Apple's iPhone share of 18.3 percent. 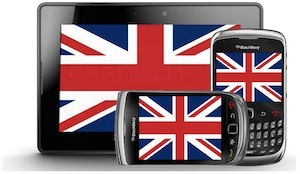 However, Android was way ahead with 45.2 percent of the UK smartphone market share. The report also states that 85 percent of the BlackBerry sales came from people who had previously owned conventional handsets, as well as the majority of them being women. The full-QWERTY-keyboard is obviously a hugely appealing feature for those who like to text a lot but the biggest reason for this increase in market share is its appeal to the younger generation. Mainly because of the low prices at which some BlackBerry devices can be purchased for, especially on Pay As You Go. For the struggling student, buying the BlackBerry Curve 9300 or 8520 is a lot more affordable than paying an arm and leg for the iPhone. Of course, there is also the appeal of BlackBerry Messenger, a topic we have touched on previously. News like this makes tingle all over knowing that Team BlackBerry can still be in with a chance of rising back to the top. RIM just need to focus and recognise that they have plenty of users outside of the US. There's plenty of support across Europe, what with their 1 million subscribers in three weeks.